English garden flowers call to mind Jane Austen-esque visions of rolling lawns, pebble pathways, and lush borders blooming with a profusion of plants. Although few homeowners boast property as big as Mansfield Park, the average gardener can create the right look by adding perennials, annuals, and accessories to create the romantic aura of the English garden style. When looking at English gardens, flowers are only part of the picture. Lush lawns planted on gently rolling hillsides with meandering gravel paths reminiscent of a park exemplify the English garden style. Most English gardens include a pond or small water feature, usually with a bridge or romantic grotto. Flowers planted as borders of color among trees and shrubs provide welcome beds of color and fragrance. Borders tend to be packed with flowers, all planted with a natural look and feel. Later additions to the English garden style include statues and 'ruins' that lend an air of romance and mystery to the garden. The English garden style came into vogue in the early 18th century. Lancelot "Capability" Brown, a famous British landscape architect, designed over one hundred gardens and parks in England and is noted for the style that eventually became known as the English garden style. His natural touch on every landscape he designed set his work apart from his predecessors, who favored fussy Baroque-style garden designs. His work was much in demand by the gentry and some examples of his gardens remain today in England. In America, a famous example of the English garden style may be seen at Old Westbury Gardens, a jewel among the preserved homes from Long Island, New York's Gold Coast era. Built in 1906, the home and garden are unusual in that the same architect, Charles Crowley, designed both the Charles II-style mansion and the flowing period gardens. 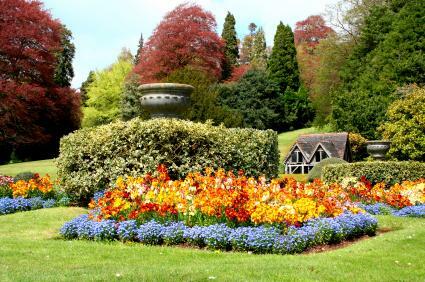 The gardens surrounding the two man made lakes or pools include all the elements of the English garden, including flowing lawns, lush shrubs and pink and white borders, best seen in the spring. Another beautiful example of English garden styles on the opposite coast is Filoli, an estate and garden near San Francisco, California. If you'd like to create an English garden in your own backyard, here are a few tips to keep in mind. First, lawns, pathways and borders are important. The lawn serves as a backdrop for the floral borders and anchors the style. Plant flowers in clusters, with an emphasis on traditional English garden flowers such as those in the list below. Pink and white shades remain popular for borders in English gardens. Include statues, birdbaths and other elements. If you don't have room for a typical English garden pond, a small wooden footbridge, placed over a circle or oval of dry stones, can give the impression of a little pond with a nod towards English garden tradition. To achieve an English garden look in your garden, choose from among the traditional English garden flowers. Perennial borders typify the English garden style, with annuals added to fill in gaps and provide bursts of color. The emphasis is on lush, abundant plantings. Create islands of color anchored by shrubs and large perennials, such as peonies, interspersed with groups of perennials. Choose from among the list with an eye towards color and bloom times, creating groups that bloom spring, summer and fall. Traditional English gardens may not include roses, but some that lean more towards a cottage-style garden do include old-fashioned roses. For ideas on roses to include in English gardens, The Rosarian provides a copy of Gertrude Jekyll's classic book on roses for English gardens on their website. Most homeowners will need to work with their existing foundation plantings. If you would like to add shrubs and trees, the following are logical choices for an English garden. Most gardeners love to study other gardens for ideas and inspiration. Amazon sells wonderful books filled with lush color pictures of English gardens. Fine Gardening magazine typically features English-style gardens and plants at least once a year, and their website is filled with videos and photos for the novice and professional gardener alike.